There are conversations that need to be had. There are feelings that need to be felt. You can run and run and run but you can never outrun the conversations and the feelings. Coyote and her father, Rodeo, live in a big converted school bus they've named Yager. Five years ago there was a car accident and that accident took the lives of Coyote's mom and Coyote's two sisters Rose and Ava. When that accident happened, Rodeo took Coyote, put both of them on the bus and started living a life on the road headed anywhere but back home to where the feelings and the conversations waited. Then, Coyote got a phone call from her grandma and she found out that the memory box she and her mom and sisters had created and buried in the local park back in Poplin Springs, Washington, was about to be lost. Coyote knew she had to get back there before the bulldozers started their work and before all the trees came down. She needed to find the right tree and dig up her box and reclaim the memories and the connections and the love they had tucked inside there. But Coyote also knew Rodeo would not go back. So, this is the story of a journey in the direction of a really great pork chop sandwich. It's the story of a "family" that grows from two lost souls, to a cat named Ivan (as in the One and Only Ivan), a boy and his mother who are running away, a man who is running to, a girl who needs a new start and one last passenger who will remain anonymous to give you the honor of meeting her in person yourself for the very first time. There's a book you may have read called CLAYTON BYRD GOES UNDERGROUND by Rita Williams-Garcia. In that story Clayton's mom does not see past her own pain. She completely ignores what Clayton needs when his grandfather passes on because of her own feelings. In this story Rodeo is guilty of the same mistake. This is a wonderful, heartwarming story about people who love each other and how they can make mistakes and hurt each other when they themselves are hurting deeply. There is another story called HARBOR ME by Jacqueline Woodson that teaches us about honoring each other's story and thinking about walking a mile in each other's shoes. Just as Kate DiCamillo gathers characters together in her stories to show us all the facets of human experience, Dan Gemeinhart has plucked a "family" of people on their own journeys and thrown them together in a bus. We're all on that bus folks. We're all on that bus. So, what it comes down to is will Rodeo get Coyote to her box in time to get her memories and her feelings back or will her mother and her two sisters stay lost to her for ever? How can Coyote learn to take care of herself? What will Lester decide to do? Will he go to Boise to be in love with Tammy and give us his own love, music? Will Val find her safe place? Will Concepcion and Mrs. Vega and her son Salvador find a new home where they can be safe and secure? We're all on the bus. We're all struggling from our own points of view. What did Rev. John Watson (Ian MacLaren) say? "Be kind for everyone you meet is fighting a hard battle." This is a grand tale of some characters you could easily choose for your best friend. It's a grand old journey across the United States in search of a pork chop sandwich with a gang who can name their favorite book, their favorite place and their favorite sandwich. It's a tale of pain and grief and choices and sharing and opportunity and Uno and a wise cat and all the richness of a life. If you loved BECAUSE OF WINN DIXIE, you will heave a sigh of relief. Someone else has gathered the gang and we are privileged to come along and watch the kindness, the compassion and the love blossom .... and hopefully we'll take some notes on how to make our own journey this extraordinary. 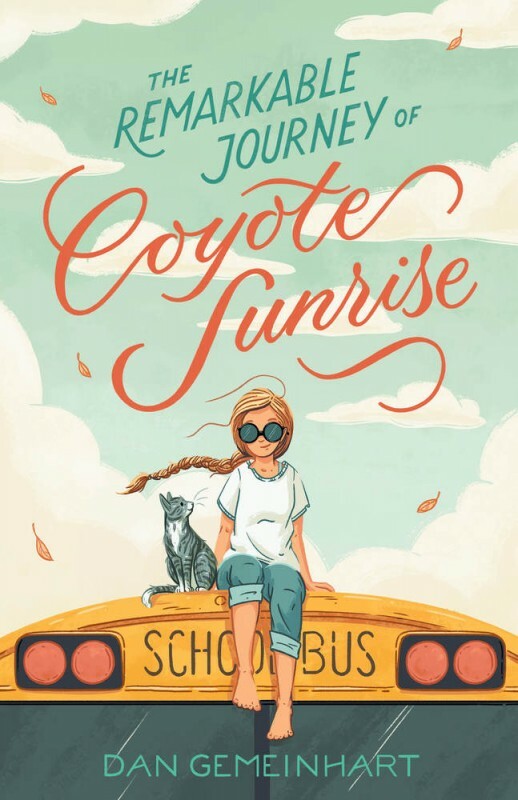 Critically acclaimed author, Dan Gemeinhart's The Remarkable Journey of Coyote Sunrise introduces young readers to an unforgettable girl trying to find her place in the world. 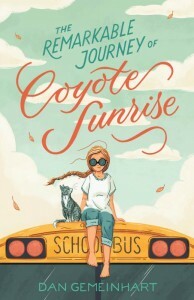 Coyote hasn’t been home in all that time, but when she learns that the park in her old neighborhood is being demolished―the very same park where she, her mom, and her sisters buried a treasured memory box―she knows she'll do whatever it takes to get back in time to save it. So she hatches a crazy plan to get her dad to drive 3,600 miles back to Washington state in four days...without him realizing it.